AV Protection 2011 is another rogue antivirus program from the same family of malware as AV Security 2012, Cloud Protection, Guard Online, AV Guard Online, OpenCloud Security,etc. It pretends to be a legitimate virus and malware remover tool but, in reality, it can not remove viruses, trojans, etc., nor will be protect your computer from legitimate future infections. The rogue is created with one purpose to trick you into purchasing the full version of the software. 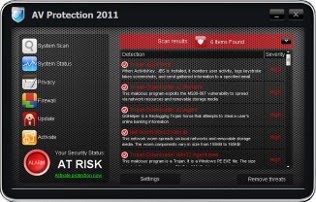 So, don`t trust anything relate to this software and remove AV Protection 2011 as soon as possible. The program is promoted and installed with the help of trojans that are mostly distributed via fake online scanners, misleading websites and using social engineering. When the trojan is started, it will download and install the rogue onto your computer. On first run, AV Protection 2011 configures itself to start automatically when Windows loads. Next, it will perform a fake system scan and detect a lot of infections that can only be removed with a full version of the program. Obviously, such results are a fraud, the program want to scare you into thinking that your computer is infected with malicious software. So, you can safety ignore the scan results. close. We are sorry for inconvenience. Running of application is impossible. The file C:\Windows\System32\notepad.exe is infected. As you can see, AV Protection 2011 is absolutely useless and what is more, even dangerous software. Most importantly, do not purchase it. Instead, please use the steps below in order to remove this malware from your computer for free. Run it and follow the prompts. Uunzip it to your desktop. Run TDSSKiller and follow the prompts. 6. Double click mbam-setup.exe to install the application. When installation is complete, make sure a checkmark is placed next to Update Malwarebytes' Anti-Malware and Launch Malwarebytes' Anti-Malware, then click Finish. If an update is found, it will download and install the latest version. 7. Once the program has loaded you will see a screen like below. 8. Select "Perform Quick Scan", then click Scan. When the scan is done, click OK, then Show Results to view the results. You will see a list of malware that Malwarebytes' Anti-Malware found on your computer. Note: list of malware may be different than what is shown in the screen below. 9. Make sure that everything is checked, and click Remove Selected. Once disinfection is finished, a log will open in Notepad and you may be prompted to Restart.